Consider these important points BEFORE choosing the best app for your needs. You can download most apps for free. That doesn't mean you won't pay for trades. Read the fine print to learn what commission fees you'll pay. Not all investment apps work on both iOS and Android devices. Some platforms also work well on computers, a useful bonus if you do most of your trading from your laptop or PC. You can set up the frequency and the amount and some apps handle the rest. This can be a great tool for passive investors. Whether you want to choose from a large variety of ETFs or prefer to invest in a specific sector (real estate, healthcare, etc.) choose the app that has what you're looking for. You Should Know: Many platforms now have Socially Responsible Investing (SRI) options. But do your research, some apps focus strictly on socially responsible investments while others treat them as an "add-on." Allocations tend to shift naturally over time. If you are the "set it and forget it" type investor, some apps automatically rebalance your portfolio to correct that drift. We've compiled a list of great choices for every type of investor. Stash was made for people with little to no prior investing experience. The app offers two main perks: a low minimum requirement and educational videos that teach new investors how the market works. Users can invest in both ETFs and stocks. The app will suggest an individualized bundle of investments based on a user's risk tolerance level and investment goals. It has options for both automatic withdrawals and "rounding up" by investing the change of user transactions into a linked account. You'll need a $5 minimum investment. Stash charges $1 per month for balances under $5,000 and 0.25% of your account's balance per year over $5,000. There are no trade fees. NOTE: $1 per month might seem low but it's a high rate compared to the competition. Other platforms typically charge a percentage of an account's total balance per year. This percentage fee can equal out to just cents every month depending on how much money is in the account. For a Stash retirement account, it'll cost you $2 per month under $5,000 and 0.25% of your total account balance once it exceeds that amount. What's the Best Investment App for iPhone and Android Users? Fidelity offers great features for both iOS and Android users. You can monitor your portfolio, make trades on the spot, receive alerts, and even do research, all on the mobile app. Check out our Full Review to see if Fidelity is right for you. Robinhood is a straightforward app for investors who are already comfortable trading and managing their own investments without help. It offers a platform to trade both stocks, ETFs, options, and cryptocurrencies for free without a minimum investment. The app's no-frills approach means you won't get market research or guidance. It also doesn't offer any retirement account options. Looking to invest in a retirement account? Learn more about our top choice, Betterment, below. The service is completely free and requires no minimum balance to get started. After account's balance reaches $2,000, users can upgrade to Robinhood Gold. This monthly fee service allows trading on borrowed funds, extended trading hours, plus larger and faster deposits. With Robinhood Gold, users choose from fee tiers ranging from $6 per month to $200 per month. These prices are based on the user's chosen buying power and account balance - they're significantly lower than other discount brokerages. You don't need a fat bank account to start investing in stocks. 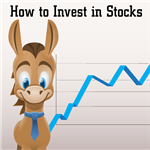 Check out How to Invest in Stocks with Little Money to get started. Not for the casual investor, Tradestation charges a monthly fee and varying per-trade fees for stock, ETF, options, futures, mutual funds, and bond trading. The service is primarily desktop-based, but also offers a streamlined mobile app. The app allows users to pull up a curated watch list and make trades with the press of just one button. You can also access charts and market data on your phone to aid in making quick decisions. A flat-fee trading plan that charges $5 per trade. A per-share trading plan that charges per each share bought, which is good for investors who trade frequently in small chunks. An unbundled plan that allows high-volume traders to potentially cut their per-share costs low with liquidity rebates. NOTE: For both the per-share and unbundled plans, Tradestation charges a $99.95 per month inactivity fee. This is imposed unless the account meets 5,000 shares, 50 options contracts, 10 futures contracts traded per month or contains at least $100,000. You Should Know: Some find their screen is too small for Tradestation app's charting. If you have a larger smartphone or tablet, you may have an easier time viewing charts. M1 Finance offers a solid option with no per-trade commission fees to trade stocks and ETFs. Users can invest not only in full shares of stocks or ETFs but also in fractional shares. The app suggests a portfolio based on personal goals, which users can then tweak to their liking by investing in additional stocks or ETFs. Alternatively, you can choose one of many premade portfolios and make adjustments. M1's systems have automatic portfolio rebalancing and deposits/withdrawals. Users can set up the app to pull money from an external account at regular intervals. For an additional yearly fee, users can also buy M1 Plus, which includes all the app's base services and a checking account. The base app is completely free after a $100 minimum deposit ($500 for a retirement account). M1 Plus, which includes a checking account, is $125 per year. What's the Best Investment App for College Students? WiseBanyan is a great option for college students. This robo-advisor app has no minimum investment requirements and doesn't charge an account management fee. You invest in ETFs in various asset classes based on your ability to handle risk, which WiseBanyan determines for you after you answer a few questions. Acorns uses a "spare change" approach by rounding up users' everyday transactions to invest in ETFs. Users can customize settings to adjust what types of transactions get rounded up, as well as doubling or tripling the amount invested with each transaction. Check out our Full Review on Acorns to see how this app works. The basic level of Acorns is completely free for college students. It costs a flat monthly fee ranging from $1 to $3 for everyone else. Adding a retirement account increases the monthly charge to $2. A retirement account and a checking account brings the cost to $3 a month. Acorns' fees are higher than many other investment accounts, which charge only percentages of the account's total balance. That fee may be worth it if you like the convenience of automated investing. No minimum investment is required. 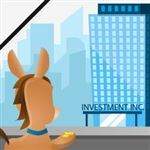 Once the app has accumulated $5 through spare change "round ups," it automatically invests in a pre-chosen portfolio. Investors can save for both long and short-term goals with Betterment. The app offers plans for retirement, safety net funds and more through its automated investing platform. Deposits are invested automatically into a pre-determined portfolio of ETFs based on each user's needs and risk tolerance. Users cannot choose individual stocks or ETFs in which to invest, which makes it better suited for hands-off investors. The app's "smart deposit" feature automatically invests extra money from linked accounts. The app costs 0.25% of an account's total balance under $100,000 and 0.40% percent above $100,000. Betterment does not require a minimum balance. Firstrade's primary appeal is its completely free trades and platform. The service charges no per-trade fees for stocks, options, mutual funds, bonds, and ETFs. Users have the option to open traditional investing accounts, retirement accounts, business accounts and more. Firstrade is best suited for those who are comfortable managing their own investments without help. Experienced users will like the app's tools, such as market data and real-time streaming quotes. You Should Know: Firstrade offers a multi-lingual experience. Chinese-speaking users have access to a fully-translated platform. User-directed trades are completely free on Firstrade. 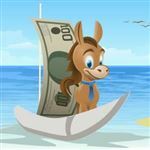 The app has no minimum deposit and offers some of the lowest commission fees available. If you want more guidance, the service offers broker-assisted fees for $19.95 per trade. Wealthfront offers traditional investing accounts and options for specific goals like saving for a child's education. The app will automatically invest and manage a user's portfolio of stocks and ETFs based on chosen goals. It tracks the user's savings for retirement, homeownership, college funds or future travel. Wealthfront does not allow users to make individual trades. The service does offer a high-yield savings account for free. Wealthfront requires a $500 minimum deposit to begin investing. The app charges an annual fee of 0.25% of an account's total balance. Opening and maintaining a savings account with Wealthfront is completely free. Here are some benefits to choosing an investment app. With an investment app, you can make trades, add more funds, or withdraw funds right from your phone. With investment apps, you'll likely save money on commissions compared to a full-service broker. Of course, that means you'll be handling the work yourself. This is only a good option if you know what you're doing. Investing apps cost as little as $5 to start. That opens the world of investing to people who don't have a lot of extra capital. Each investor has different needs. It's important to know yours before choosing an investment app. Take the time research fees and features, then begin investing responsibly. Leave a comment about Best Investment Apps? HostGator is one of the largest web hosts on the market. They host over 9 million domain names and have over 400,000 customers. Their advertised plans start at $2.75/month, and they guarantee a 99.9% uptime.